Enjoying brandy old fashioneds and classic Wisconsin fish fry's in North East Wisconsin. Ziggy's is a classic supper club experience with complimentary snacks in the bar area and plenty of food throughout the meal. We put our name in with the host and proceeded to the bar to order our brandy old fashioned's. They had a cheese and cracker spread to snack on as we waited for our table. The waitress came to take our order in the bar within 10 minutes of arriving. Supper clubs take your order at the bar and invite you to the dining room to enjoy a relish tray and cracker basket. I ordered the perch platter, which comes with soup or salad and a choice of potato. I was disappointed to learn that the coleslaw was a potato option; I got the french fries. My friend got the prime rib with baby red potatoes, and we both opted for clam chowder as our soup. With our order taken we went to the dining room, where there were plenty of open tables. This place is pretty busy on a Friday night but 7:00pm must be the late crowd when it starts to clear out. 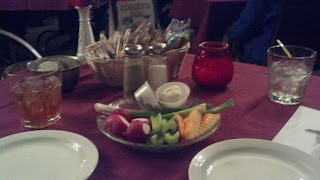 The soup was good, and we enjoyed the relish tray and cracker basket with cheese and liver pate for spreads. Dinner came out quickly and my perch had a light breading that was cooked golden brown, and tasted very good. The fries were cooked crispy, just the way I like them. My friend's prime rib was medium-rare and he was very happy with how it turned out. Rolls were served with our dinner but they were a bit dense. The thing I like about Ziggy's is you get a complimentary dessert with your meal, nothing fancy but a free dessert is always a treat. But our waitress informed us they had just run out of the banana cream pudding, and I was looking forward to it. I asked for a substitute and she said she would have to charge us for a normal dessert, so I told her I enjoy coming here for the complimentary dessert and given the circumstance a substitute was in order. She went back and got us a slice of cheesecake to share, and it was delicious! 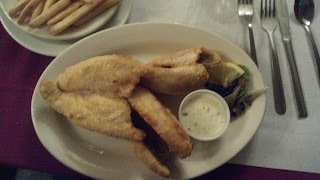 Ziggy's does not offer a classic Wisconsin fish fry experience, but they do have the supper club experience down pat. The food was tasty and it's definitely worth a visit. Club Chalet is a classic Wisconsin experience all around. I wasn't sure what to expect when we walked in, the place has some unique architecture and I now get why they call it Club Chalet. We got there at 6:45 and had 10 people in our party so waiting 1 hour and 15 minutes was not that unreasonable. Drinks were standard fare, but we enjoyed chatting and drinking before being called to our table. Like at many supper clubs, our order was taken in the bar, and only when our salad and soups were ready were we invited to sit in the dining room. 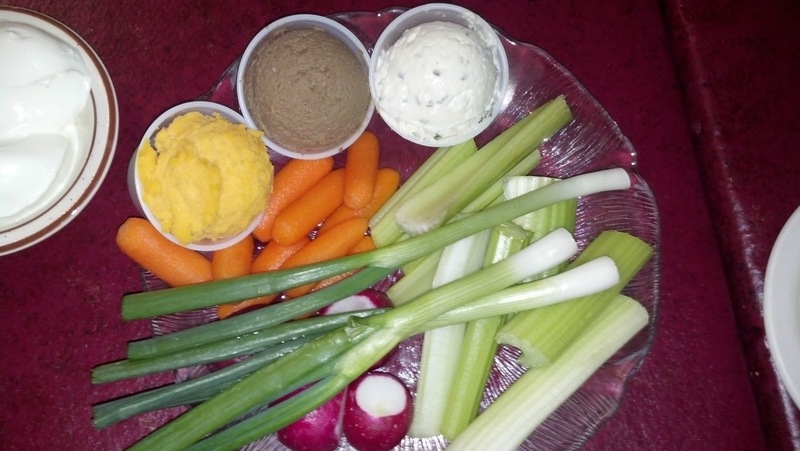 Upon sitting down, we had a table with our salads all laid out, a cracker basket with liver pate and cheese spread, and a relish tray, what one would expect from a good Wisconsin supper club. Next up was our soup, and yes we were given both salad and soup with our meal. Rolls were served with soup. Then came dinner. Some in our party got prime rib, some got a seafood platter, I of course got the perch dinner. The perch dinner came with 5 butterfly perch fillets and it looked and tasted like lake perch, which was great. Breading was light and delicious and perfectly cooked. Potato sides were varied, I got the potato wedges, and some of us got the roasted baby red potatoes. I've never had such good potato wedges, they were crispy and delicious and not too heavy. The side of cream based coleslaw was also really good. And of course we got our rye bread that was buttered and had raw white onion sandwiched between the 2 slices of bread. A classic Wisconsin fish fry is not complete with our rye bread with raw onion. Supper clubs offer their own classic Wisconsin experience, but many supper clubs don't quite offer the classic Wisconsin fish fry experience. Club Chalet offered both experiences and I'll make a visit back to this establishment again. What is a blog about Brandy Old Fashioned's without a Brandy Old Fashioned recipe. In a chilled old fashioned glass or small tumbler, muddle the sugar, bitters, orange, and cherry into a paste. Some people frown upon muddling the orange peel with the orange claiming it adds a bitter flavor, see what you prefer. You can buy a wooden muddler, or just use something in your kitchen that is good at mashing up stuff in a glass. Add ice and brandy and fill the glass full with your sweet or sour mixer. For sweet I like to garnish with some cherries, for sour I garnish with brussel sprouts and pickled mushrooms. It goes without saying that you should use Korbel Brandy, especially if you're from Wisconsin. More on why in a future post. Colonial House is a supper club and has some of the classic fish fry offerings. By the time we go there, the place was clearing out so we were seated right away after ordering a drink at the bar. We were seated right next to the fireplace which was nice and warm. The waitress came quickly to take our order. I got the perch platter with a side of potato salad. They do offer a variety of potato sides you would expect from a supper club. The salad bar options were your standard offerings with two soups to choose from. Once we were done with our salads the food came out. My perch platter had 5 pieces of crisp and tasty perch and the potato salad was good also. A good experience overall, I will be back at some point but there are plenty of fish fry establishments to check out. 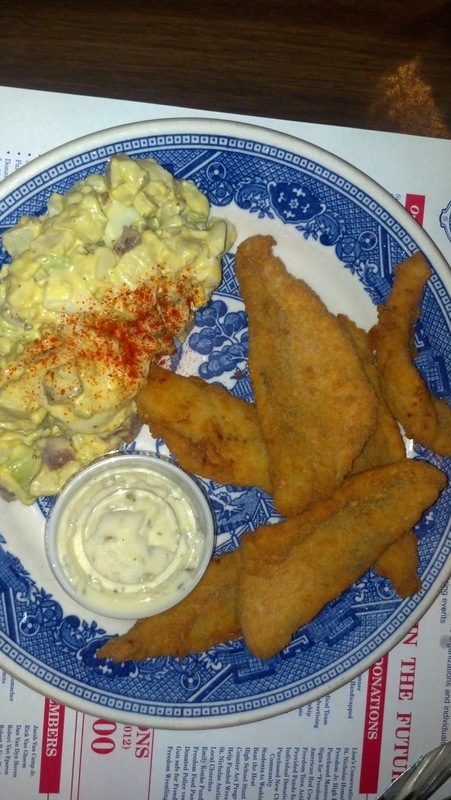 Little Chicago is a new establishment in Kaukauna and offers a supper club dining experience more than a classic Fish Fry experience, but a Wisconsin tradition nonetheless. The food was excellent as was the atmosphere and prices. 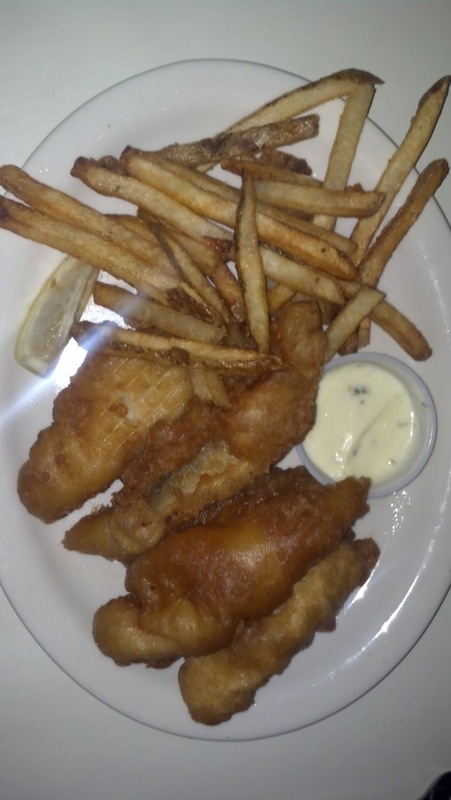 I ordered the perch platter for $14.95 and that came with the salad bar, my choice of beer battered or breaded perch, and a variety of potato options including homemade french fries. Our order was taken at the bar and we were seated within 10 minutes enjoying our salad bar. The night we went was a bad snowstorm so we didn't have the suffer the usual hour wait. Waiting an hour for food may be painful, but it usually indicates the food is worth it. The salad bar was your typical salad bar with salad, dressings, toppings, pasta sides, pickled gizzards, cracker basket, and cheese spreads. When we sat at our table we had a fresh baked loaf of bread waiting for us. I got the beer batter perch which was delicious, but the coating was a bit much. I also got the homemade fries which I will definitely order again when we go there next. All in all a pleasant experience and I'd recommend giving them a try, but expect to wait a while for a table on a normal Friday night. I also noticed they had an amazing Sunday brunch buffet offering for $12.95 that I must check out sometime. 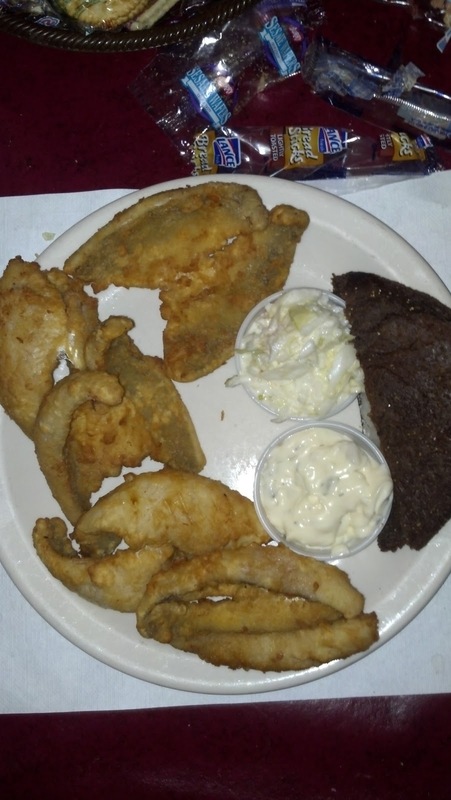 We are seeking out the Classic Wisconsin Fish Fry's that meet the following components. But just because a fish fry may not meet all components, it could still be a great fish fry, so keep that in mind.